A war rior as fearless as he is ornery, Kled is a popular folk hero in Noxus. Embodying the furious bravado of his nation, he is an icon beloved by the empire’s soldiers, distrusted by its officers, and loathed by the nobility. Tall tales such as ‘The Great Hussar’, ‘The High General Marshal Sergeant’, and ‘The Mountain Admiral’ trace back to the founding of the empire. Many soldiers claim Kled has fought in every campaign the legions have waged, has ‘acquired’ every military title, and has never once backed down from a fight. 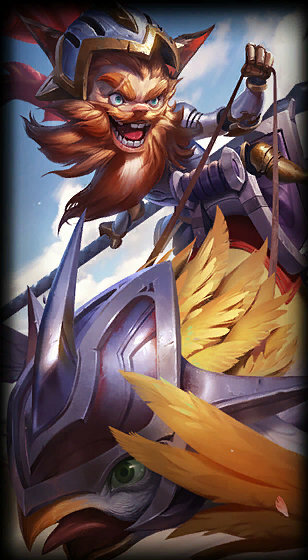 Though the veracity of the details is often questionable, one part of his legend is undeniable: Charging into battle on his un-trusty steed, Skaarl, Kled fights to protect what’s his… and to take whatever he can get.